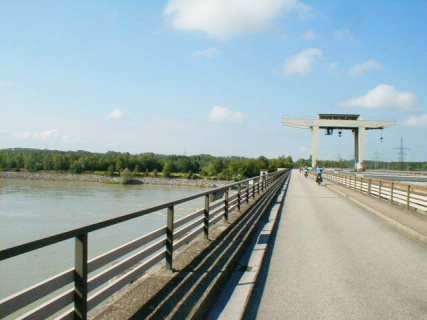 We coasted down the hill to the Danube and turned left onto the Danube Bike Path (Donauradweg) on the left (north) bank. For the first 16 miles the left bank is still in Germany, although Austria is right across the river. The weather was iffy, the kind where it stops raining as soon as you can get your rain gear out. 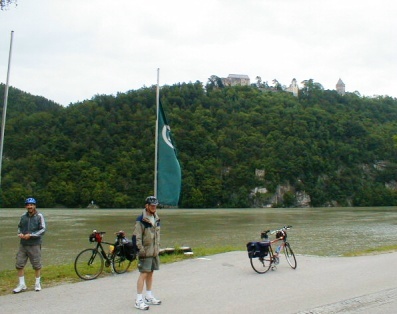 Here the Danube is relatively narrow and swift moving with steep, forested hills on both sides, with just enough room for road, rail line, and bike path along the river bank. 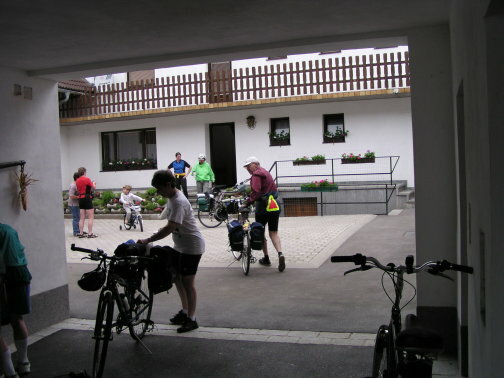 Unlike on most Austrian bike routes, we encountered only a few small towns. About noon a thunder storm hit. Fortunately, we were stopped for lunch at picnic area with a shelter at a hydroelectric dam near the border town of Jochenheim. After about 30 minutes we were able to get underway, still dry; and we encountered no further rain that day. As we left Jochenheim we entered the province of Upper Austria (Oberöstereich). The highlight of the day was crossing the river on a bike ferry (radfähre) in the vicinity of the famous "double hinge", the so-called Schögener Schlinge, near the village of Schlögen. The crossing was necessary because for a short distance there is no bike path or road between the river and the hillside on the north bank. 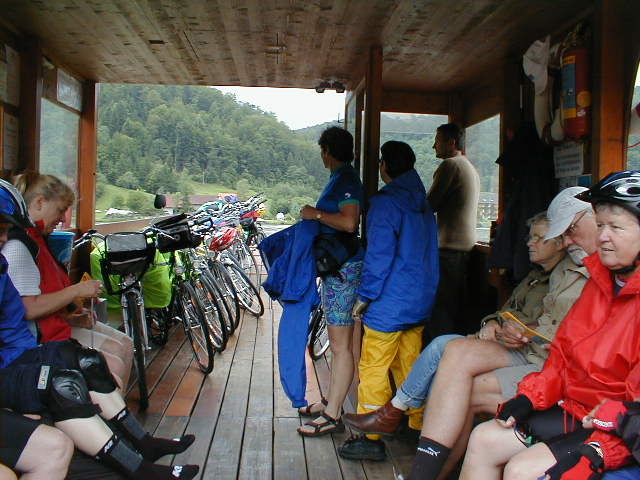 Crossing the Danube on the bike ferry near Schlögen. The short day ended at the village of Inzell (pop. 14). This time we did not have to climb a hill to find our lodging. 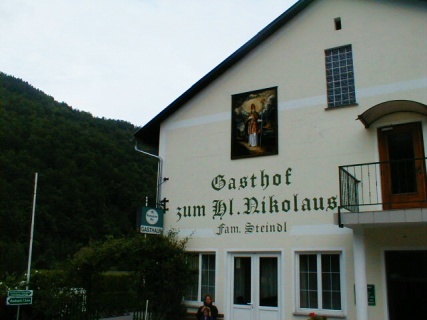 In fact the bike route went right through the parking lot of Gasthof zum Heiligen Nikolaus (St. Nicholas Inn) that included a campground. This was a popular spot for commercial, escorted tours. One from the Czech Republic had a large motor coach pulling a large bike trailer (the SAG wagon?). There are commercial tours which stay at all types of lodging; but I believe this one camped. View from the balcony of Gasthof zum Heiligen Nikolaus. There were reports of singing coming from the campplatz during the night. Fortunately, I slept through it. 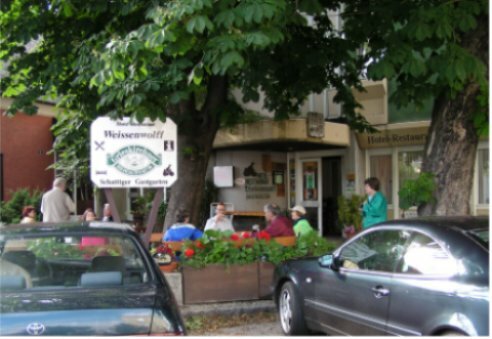 The sign on the building next door says "radlerhof", which is a homemade word indicating that it is a gasthof which caters to radlers, Austrian slang for bicyclists. Formerly church of St. Nicholas, now a private chapel maintained by an Inzell family. The same type of scenery continued for first half of today's ride: steep, wooded hillsides with few towns. Schloss Neuhaus near Untermühl (a schloss is a large manor house, formerly the residence of a noble personage). 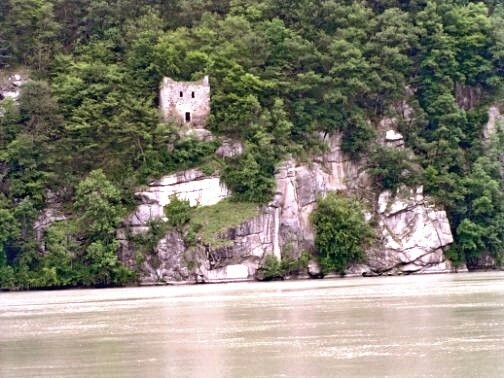 A small castle can be seen just above the rocks, about 2/3 of the way down to the river. The small castle up close. After Aschach an der Donau and for the next day and a half, the valley became much wider. Here the bike path often runs on a levee in between the river and wooded wetlands (Au), with farmland on the other side of the Au. Once again right at lunch time it began raining hard. This time we were fortunate enough to be in a town and had our picnic lunch at an outdoor cafe with large umbrellas that protected us from the rain. We ordered coffee and ice cream to make it legitimate. 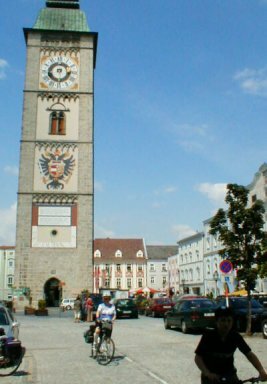 It was about 3:00 when we approached Linz, the third largest city in Austria, on the bike path alongside the river opposite the main square. 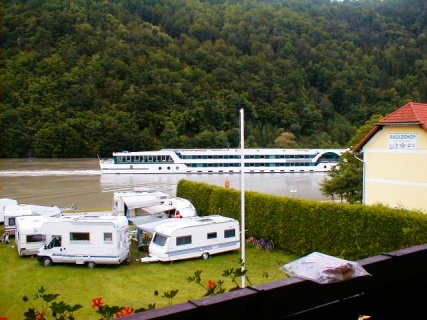 Because I had made reservations over the phone just before leaving home at a privatzimmer (private rooms) in Steyregg, five miles ahead, and thus had no written confirmation, we decided to proceed without crossing the river into Linz. We would decide later whether to come back for supper. In due course we pulled off onto a road paralleling the bike path and came to the address listed in the Steyregg Tourist Office website. There was no sign outside and looked unlike any house, much less a privatzimmer, we had seen in 8 years of touring in Austria. There were weeds among the few flowers; and junk was stored outside. Seeing eight bikes in the drive way, the owner came out of the house next door and showed us in. There were personal belongings in some of the rooms; and the best I could gather was that they were rented to students who would be coming back after vacation. Despite our initial misgivings, the accommodations turned out be very nice, with a kitchen (used to make coffee the next morning) and a dining area (used to play cards in the evening). 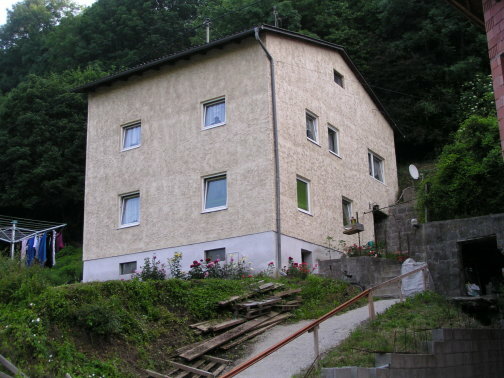 Unusual privatzimmer in Steyregg. The garage to the lower right was filled with junk bicycles. On our way to supper in Steyregg, we stopped at a grocery store to stock up for breakfast, since breakfast was not included with the lodging. We ate outside at a hotel restaurant. The quality (high) and price (low) were the same as gasthofs which we usually patronize. 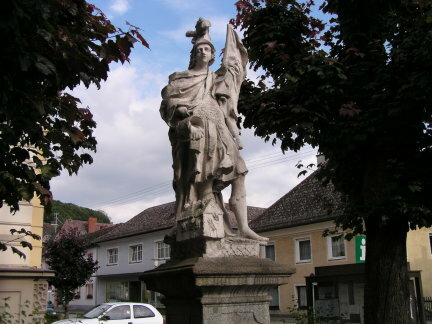 St. Florian statue on Steyregg's main square (hauptplatz) across from the hotel restaurant. This would certainly put the ACLU into a tizzy; and would definitely not pass muster with the supreme court. 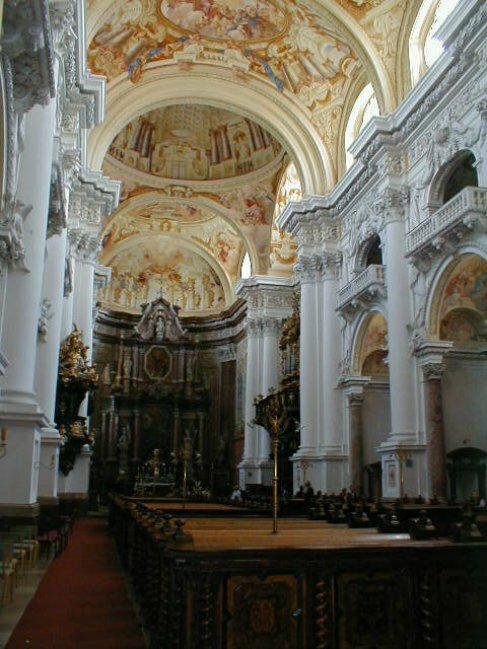 St. Florian was a Roman soldier and martyr who lived near the present day city of Enns, Austria in the 4th century. He is the patron saint of Austria, and for some reason of fire fighters. He is almost always depicted pouring water on a burning house at his feet. No self-respecting fire house (feuerwehrhaus) would be without a statue of St. Florian out front..
We continued along the levee with Linz chemical plants on the opposite side of the river. 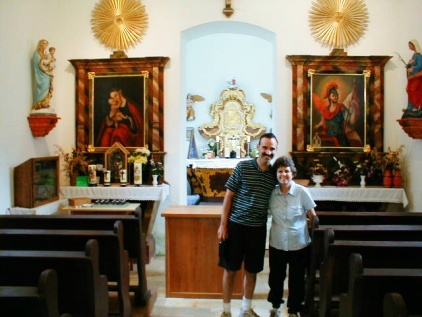 We had decided to make a side trip to the well-known St. Florian Augustinian Monastery (Augustiner Chorherrenstift) in the town of the same name on the south side of the river, resulting in 6 bonus miles. Thus we crossed over the river using the bike path on the conveniently located hydroelectric power plant dam. The town of St. Florian was reached via a series of quiet farm roads designated and signed as the St. Florianweg. Some biked and some walked a block straight up from the center of St. Florian to the monastery, while others rested in the shade in the nice town square. 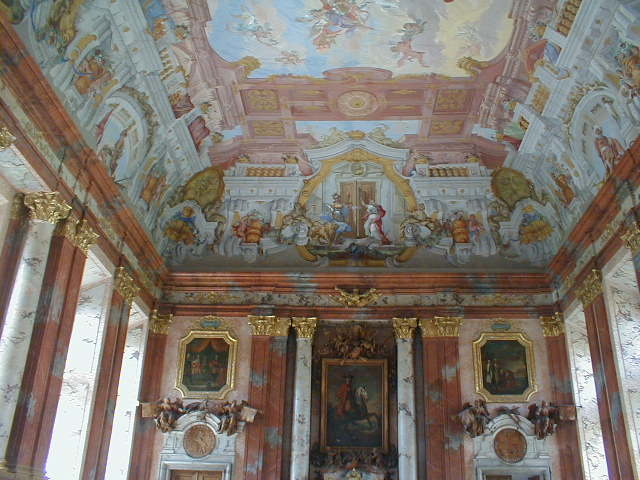 Visitor's hall at St. Florian Monastery. 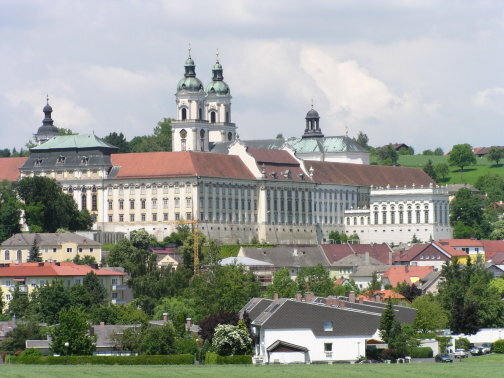 One of the functions of monasteries was to host visitors, including dignitaries such as the Hapsburg emperor. The next point of interest after making our way back to the main route was the city of Enns, billed as the oldest city in Austria. 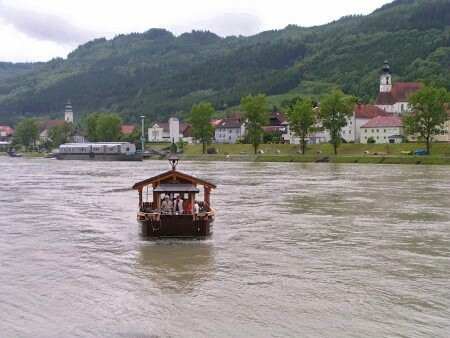 It sits near the confluence of the Enns river, which flows out of the Alps about 60 miles south of Salzburg. 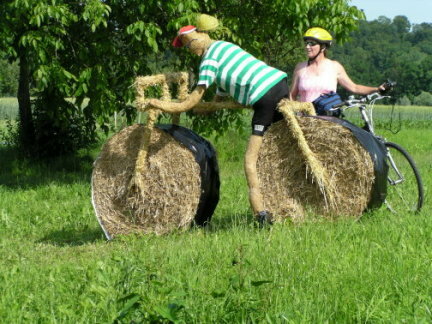 We had done the Enns Bike Path (Ennsradweg) in 2000, but didn't quite make it to the end. The hauptplatz features a tower built in 1565. Enn's hauptplatz was not one of my favorites: it was not a pedestrian zone and there were no rest spots shaded from the bright sun. Parrish church and maypole in Enns. 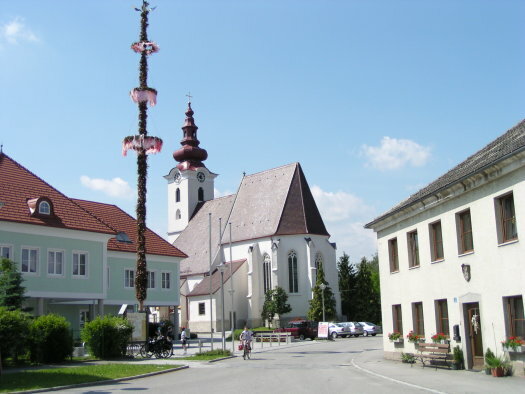 This is the only maypole I have ever seen in Austria. They are normally associated with Bavaria. 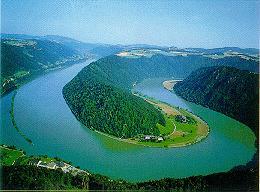 As we left Enns and crossed the Enns River, we entered the province of Lower Austria (Niederöstereich). 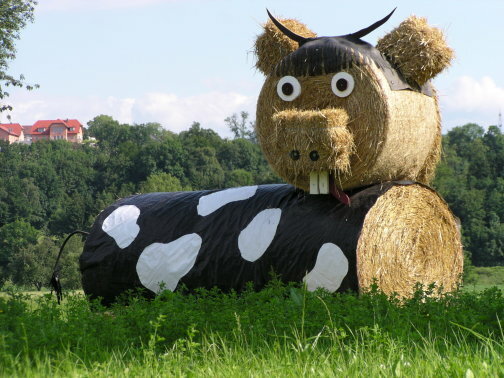 Continuing through relatively flat farmland south of the Danube we reach Ardagger Markt, but not before encountering four strange, larger than life straw figures. Our night's lodging was a farm house (bauernhof) just outside Ardagger Stift, a small village 2 miles south of Ardagger Markt. Ardagger Markt also began our detour southward into the Alps along the Ybbs River Valley Bike Route (Ybbstalweg). But first we had to get to the Ybbs. From Ardagger Markt it is only 5 miles to the Ybbs River at Amstetten; whereas it would be over 30 miles if we had continued along the Danube to its confluence with the Ybbs at Ybbs and der Donau and then followed the Ybbs upstream. But of course the shorter route would have a hill; whereas the longer route along the river valleys is flat. First rule of bike route planning: between any two river valleys is a hill. 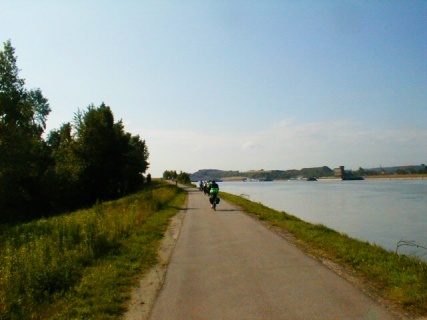 At first as we left the Danube, there was a gradual uphill on a bike path alongside the road. But then there was a short, steep turnoff into Ardagger Stift, and then another short steep climb to the farm house just outside the village. Unfortunately, it was the local gasthof's ruhetag (literally quiet day, meaning it's closed). But fortunately, the lady of the house saved us by calling a gasthof back in Ardagger Markt whose owner took all 8 of us to and from the gasthof. Packing up in the courtyard of the Vierkanterhof in Ardagger Stift. The house is in the background; and the barns to the left, right, and foreground. The little fellow really wanted to ride with us.